Hi. Welcome to STYLE SCOUT with Bri Holloway. I'm your host Bri and I'm always looking for a sophisticated twist on the trend. 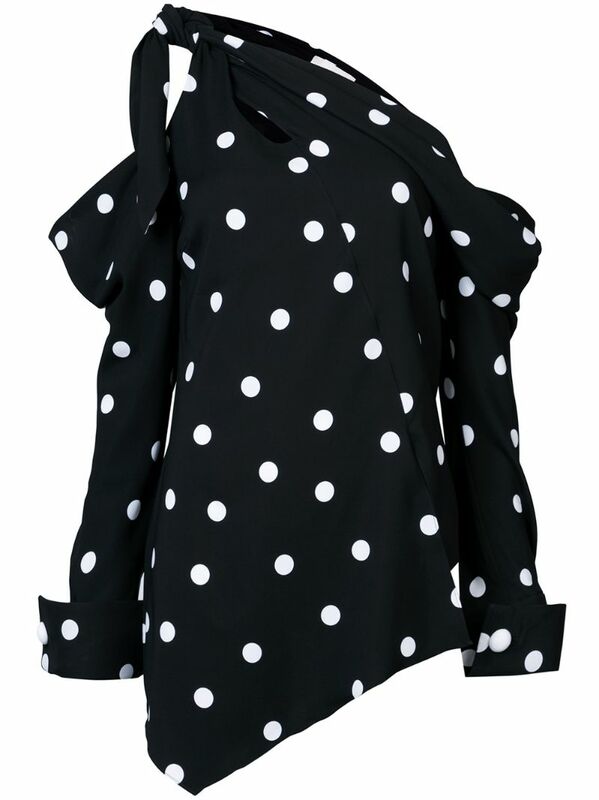 First the trend this week is POLKA DOTS! Playful. Sweet. Ultra-feminine. 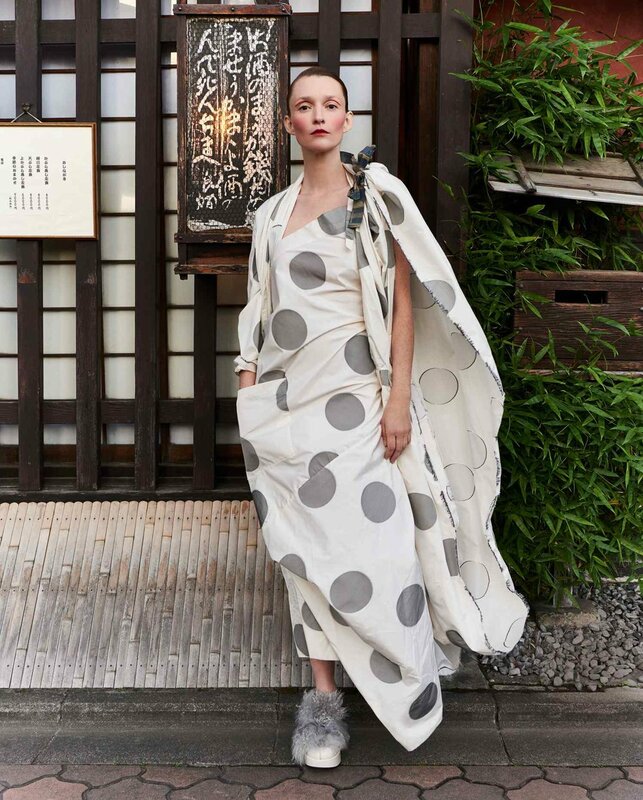 Polka-dots are everywhere this season. From blouses, shoes to gowns this pattern has taken over. America's love affair, with polka-dots, began in 1926, when Miss America, was photographed wearing a polka-dot swimsuit. 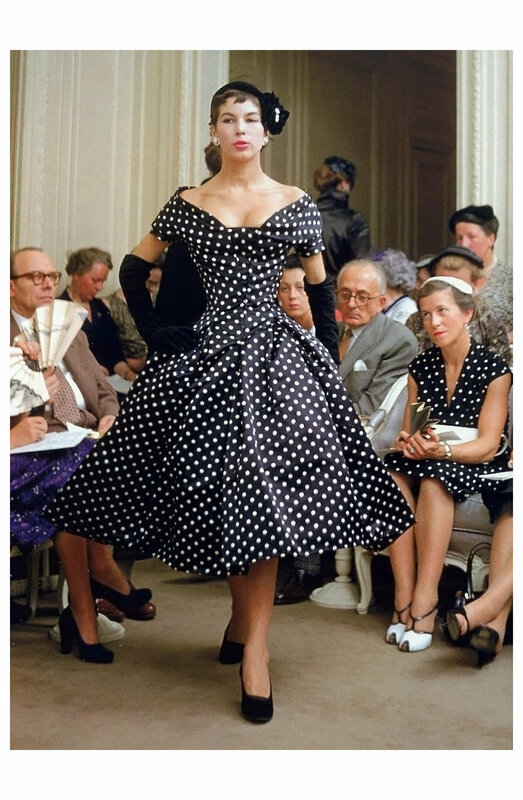 It wasn't until Christian Dior, introduced the "New Look," did the polka-dot pattern, become associated with high-end fashion. 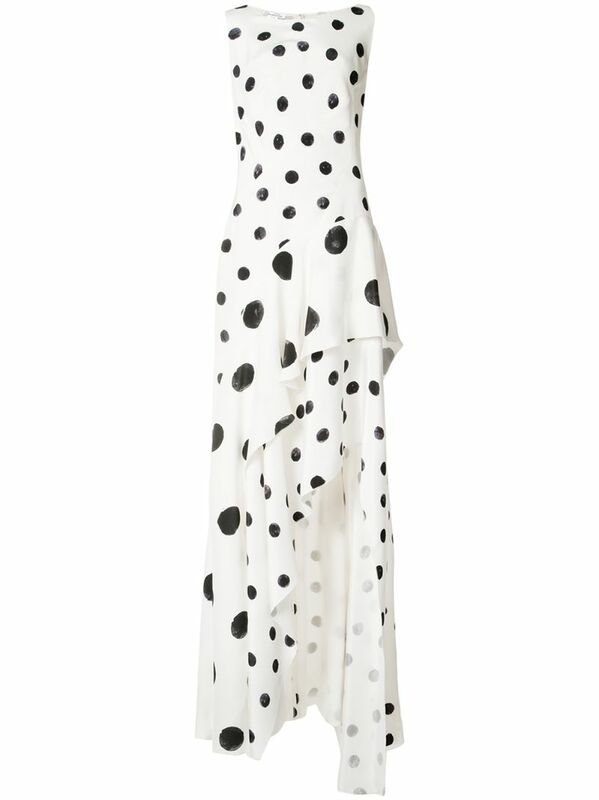 This season, Vivienne Westwood, looked to her archives to create this bold silk polka-dot evening gown. In honor of Balenciaga's 100th anniversary, the house also looked to their archives, to interpret what modern elegance is, in today's world. Isa Arfen reconfigured the pattern on tulle bustiers, dresses and jackets. So what's the sophisticated twist on the trend? Don't overwhelm your frame with this pattern. I recommend using it sparingly. Here I've combined a Christina Constas polka-dot bustier with white J BRAND jeans for a fresh, easy summer look. This bustier is a great transitional piece and works well when paired with dark tailored trousers. I love how the ruffles of the sleeve play with the flare of the jeans. Thanks for joining me on STYLE SCOUT and until next time I'm Bri Holloway. I'm always looking for a sophisticated twist on the trend. 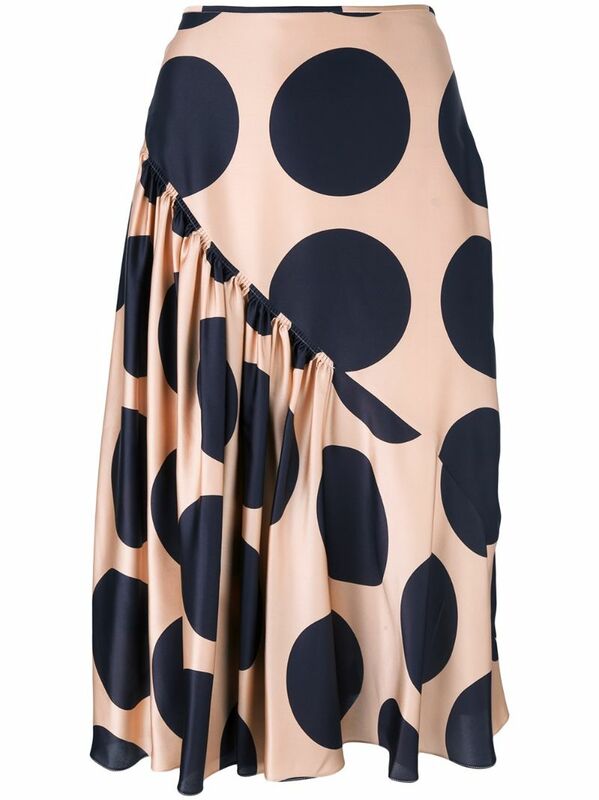 This season, Vivienne Westwood, looked to her archives to create this bold silk polka-dot evening gown. In honor of Balenciaga's 100th anniversary, the house also looked to their archives, to interpret what modern elegance is, in today's world. Isa Arfen reconfigured the pattern on tulle bustiers, dresses and jackets. So what's the sophisticated twist on the trend? Don't overwhelm your frame with this pattern. I recommend using it sparingly. Here I've combined a Christina Constas polka-dot bustier with white J BRAND jeans for a fresh, easy summer look. This bustier is a great transitional piece and works well when paired with dark tailored trousers. I love how the ruffles of the sleeve play with the flare of the jeans. Thanks for joining me on STYLE SCOUT and until next time I'm Bri Holloway. I'm always looking for a sophisticated twist on the trend. Isa Arfen reconfigured the pattern on tulle bustiers, dresses and jackets. So what's the sophisticated twist on the trend? Don't overwhelm your frame with this pattern. I recommend using it sparingly. Here I've combined a Christina Constas polka-dot bustier with white J BRAND jeans for a fresh, easy summer look. This bustier is a great transitional piece and works well when paired with dark tailored trousers. I love how the ruffles of the sleeve play with the flare of the jeans. Thanks for joining me on STYLE SCOUT and until next time I'm Bri Holloway. I'm always looking for a sophisticated twist on the trend. Don't overwhelm your frame with this pattern. I recommend using it sparingly. Here I've combined a Christina Constas polka-dot bustier with white J BRAND jeans for a fresh, easy summer look. This bustier is a great transitional piece and works well when paired with dark tailored trousers. I love how the ruffles of the sleeve play with the flare of the jeans. Thanks for joining me on STYLE SCOUT and until next time I'm Bri Holloway. I'm always looking for a sophisticated twist on the trend.